Forget the traditional Easter Sunday roast and bad TV at nan’s house. This year, why not dance to the The Cuban Brothers, bounce with your besties, create the ultimate festival mask or slip into a peaceful gong bath at the fun-filled, well-chilled and plenty-o-thrills Dreamland X Camp Bestival Easter Sunday Party? The UK’s favourite family festival has joined forces with the UK’s coolest amusement park to give families an Easter break to remember down by the sea in Margate - and it’s free to enter. 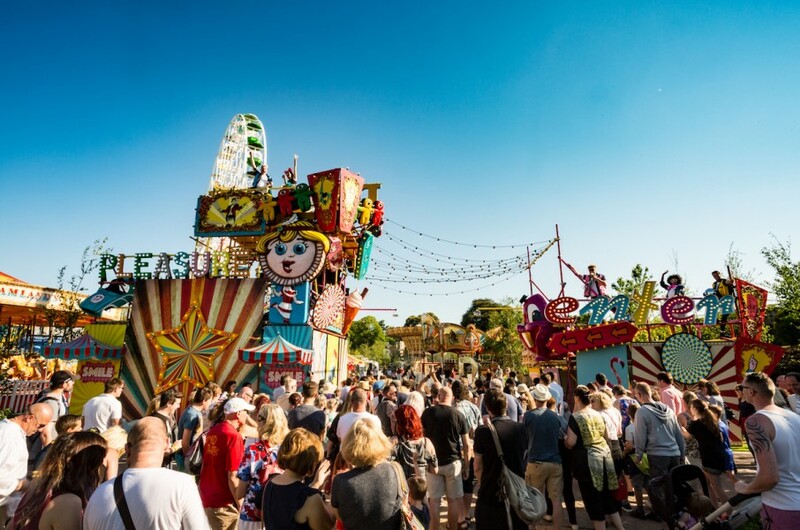 Dreamland Margate reopens for the season on Saturday 6th April with a full park takeover by Camp Bestival throughout the holidays, culminating in an extravagant all day party on Easter Sunday 21st April. Guests will have three unique Camp Bestival installations to explore - the 8m tall Love-Bot that spreads love and joy to all, a mini temple and Bollywood chill out zone, and - returning to Dreamland for the second time - The World’s Biggest Bouncy Castle (taller than the Great Wall of China and accommodates 100 bouncers at a time)! The Easter Sunday party, curated by ‘Family da Bank’ (founder and DJ Rob da Bank and his family team), kicks off on Sunday 21st April with live music from funk legends The Cuban Brothers, Soup from Jurassic 5 presents Fullee Love Collective, plus Dat Brass, Mr B The Gentleman Rhymer, Miss Kiddy and The Cads, and the Kent Soul Choir. Those in need of relaxation can dive into the pop-up Sleep Retreat with yoga, gong baths and meditation from local relaxation experts, while other ravers can enjoy tunes from Rob da Bank himself and other wild DJs, with arts, crafts and creative workshops for youngsters. In between the raves and revels, guests can enjoy the golden sands of Margate beach on Dreamland’s doorstep. All just 90mins from London by high speed rail. Guests can purchase unlimited ride wristbands in advance (25% off when bought online at www.dreamland.co.uk , or choose Dreamland Membership for unlimited rides during park opening plus special discounts and exclusive membership perks on food and drink and ticketed events all year round. The Camp Bestival takeover will be during normal park opening hours, and there will be no festival camping or overnight activity. Dreamland will be open daily during the Easter holidays, and open weekends and bank holidays during term time.